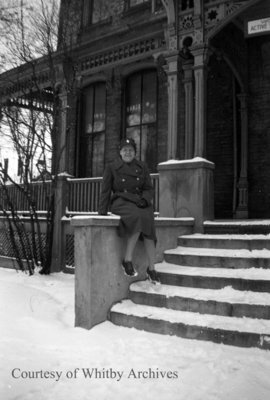 A black and white medium format negative of an unidentified woman in her Canadian Women's Army Corps uniform taken in winter. In this view the woman is sitting on a wall beside a set of cement stairs. Unidentified Woman in Uniform, c.1940s, Marjorie Ruddy. Whitby Archives A2013_040_413.